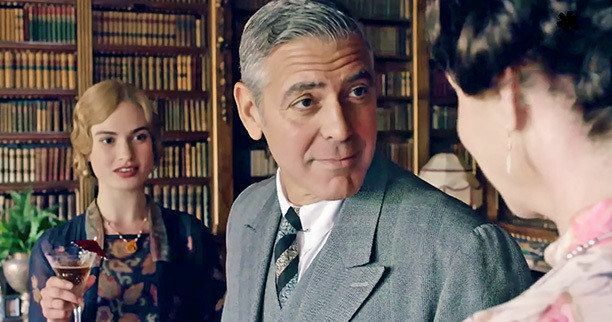 George Clooney makes his return to the small screen, of sorts, in a brief clip from a Downton Abbey short film that will air during ITV's charity holiday special Text Santa, airing on December 19. This scene from Downton Abbey: Text Santa shows Cora (Elizabeth McGovern) approaching her "dearest," revealing that Lord and Lady Carlisle have asked them to dinner, when none other than George Clooney turns around. It remains to be seen if Cora has actually mistaken whoever George Clooney is playing for Lord Grantham (Hugh Bonneville). People first confirmed George Clooney's Downton Abbey appearance back in September, revealing that he is playing a wedding guest. Naturally, we don't know whose wedding it may be, but that report also revealed that this skit will not debut in the U.S. George Clooney became friends with series star Hugh Bonneville while they were shooting the World War II drama The Monuments Men. Check out this brief clip below for Downton Abbey's Text Santa charity event, which airs December 18 on ITV. We'll be sure to keep you posted if the full version becomes available later this month. Season 5 of Downton Abbey has already aired in the U.K., and will debut in the U.S. January 5 on PBS. Related: 69th Annual Golden Globe Awards Winners! 69th Annual Golden Globe Awards Nominations!